Sometimes you receive a jolt that turns your mind towards things that have happened just now and in the distant past. The trip to Scunthorpe was never going to be easy, against a physical side that had only conceded five goals up to that point. All seemed to be going well until Lee Evans was sent off: it was to be the first real low point of the afternoon. But Nick Powell’s opportunism saved the day for Paul Cook’s team, Latics coming away with a 2-1 victory despite playing the final third of the game with ten men. But the feel-good factor of the three points gained in Lincolnshire was to dissipate soon after when David Sharpe’s tweet announced the passing away of Ian McNeill at the age of 85. For me McNeill ranks among the best-ever Wigan Athletic managers. Some would say that you cannot compare his achievements with those that came decades later such as those of Paul Jewell and Roberto Martinez. Jewell got Latics to the Premier League and the League Cup final, Martinez got wins over the biggest clubs in England, including that eventful day at Wembley in 2013. What had McNeill achieved that could place him in a category up there with those two? Lots has been written about Ian McNeill’s career. He was an inside forward for Aberdeen, Leicester, Brighton and Southend. He went on to spend decades in management, then as a scout in later years. He was manager at Wigan from 1968-70, doing a second spell from 1976-81. His Latics teams were a pleasure to watch as he always seemed to insist that they play the “right” way. Good football was his expectation. He was an expert in scouting out talent, bringing in players who would provide the backbones of teams for years to come. McNeill was appointed in the summer of 1968 to lead an ambitious Wigan Athletic into the newly formed Northern Premier League. An archaic system was still in place by which the bottom four clubs in Division 4 would apply for re-election, together with non-league aspirants. The Football League was almost a closed shop with clubs playing the “old pals act” by voting for those four clubs. In the previous eighteen years only two non-league clubs had been elected. The non-league vote had been repeatedly split, with anything up to half a dozen clubs applying each year. However, the creation of a northern super league, composed of the top clubs from the various regional competitions, was a real step forward. Winning such a league would certainly give more kudos than the Cheshire County League, even if it had been the best of the northern regional competitions. Moreover, the prospect of only the winners of the NPL and the Southern League applying for election would make sense. The NPL was to prove key in enabling Wigan Athletic in their quest for a place in the Football League. The NPL was to comprise 7 clubs from the Cheshire County League, 5 from the Lancashire Combination, 4 from the Midland Counties League, 3 from the Northern Regional League and one from the West Midlands League. Interest in Wigan was high and Latics’ first game at Springfield Park against Ashington was to draw a crowd of 6,721 – the highest home league attendance for 13 years. Ian McNeill had been managing Ross County, guiding them to their first ever Highland League title. His contacts in Scotland were to prove invaluable and he brought in the likes of David Breen, Benny Cairney, Doug Coutts, Jim Fleming, Jimmy Lynn, Jim Savage and Billy Sutherland. But the most notable of all in McNeill’s squad that year was not a Scot, but an ex-youth player from Arsenal, who had played just three games in the Cheshire League the previous season. Just 19 years old at the time, Ian Gillibrand soon established himself as a regular in the team. Although he lacked height for a central defender, Gilly had an impressive leap and his reading of the game made him look like the non-league version of Bobby Moore. He was to play a further ten seasons at the club, breaking the record for his number of appearances. McNeill was keen to win the NPL in its inaugural season, but so too were the previous season’s Cheshire League champions, Macclesfield Town. McNeill paid Runcorn a huge £3,000 for Alan Ryan, who had scored a remarkable 66 goals in the previous season. But despite having an excellent record of record of W18 D12 L8, Latics were to finish in second place. Attendances had almost doubled from an average of 1,801 the previous season in the Cheshire League to 3,393. The following season was an even better one for Latics, with a record of W20 D12 L6, but they were to once again to finish behind Macclesfield, this time on goal difference. Despite doing a great in those two initial NPL seasons McNeill was to leave the club following a disagreement with the chairman. But he left behind a very strong base of players who went on to win the NPL the following season under Gordon Milne. McNeill re-joined Latics in the summer of 1976. Latics finished in a mid-table position in his first season back, but once again he used his scouting connections to pick up bargains in the transfer market for the 1977-78 season. Latics went on to finish second, but could apply for Football League status because the champions, Boston United, did not have ground facilities up to the required standard. Their election into the Football League in 1978 was a sensation, after 34 years of unsuccessfully applying. 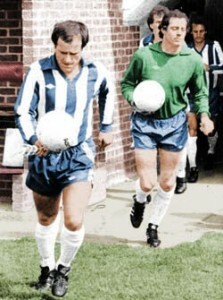 Ian Gillibrand leads Latics out at Hereford. Thanks to Wigan Athletic Supporters Club for the photo. The photo of Ian Gillibrand leading Latics out to their first Football League match at Hereford is one that continues to stick in the minds of the more senior supporters. Wigan finished in 6th place in their first two seasons in Division 4, but McNeill left in 1981 when they were to finish in mid-table. He joined Chelsea as assistant manager and was instrumental in bringing in players like Kerry Dixon and David Speedie to the west London club. Wigan replaced McNeill with Larry Lloyd, who was given a level of financial support to which McNeill had not been accustomed. Lloyd built on the firm base provided by McNeill to win promotion in the 1981-82 season. 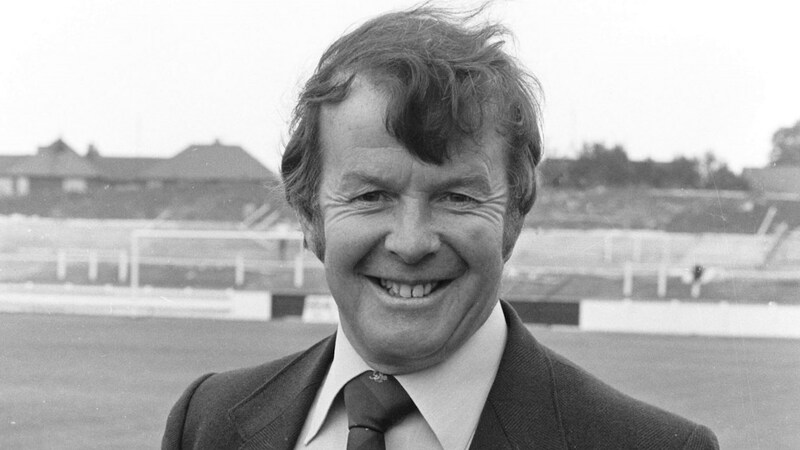 Ian McNeill will be remembered as the manager who led Wigan Athletic to their inaugural seasons in the Northern Premier League in 1968-69 and the Fourth Division of the Football League in 1978-79. But more than anything else he will be remembered for his positive approach to the game of football. Paul Cook is in his early days as Wigan Athletic manager. Like McNeill, Jewell and Martinez he will insist that his teams play his brand of football, akin to that nebulous criterion “The Wigan Way”. Cook believes in attacking football and the players are clearly enjoying his positive approach. Promotion back to the Championship is a distinct possibility this season. It is to be hoped that Cook will be given the kind of longevity afforded to his predecessors – McNeill, Jewell and Martinez. We can only hope that Cook too will become a Wigan Athletic legend as a manager. Photo is a colourisation by the on-line Latics artist George Chilvers, nice comments about Ian and also “Gillie” both Latics Legends. Impressive work by George. What a talent!